The idea is for you to think of Gwynnie Bee as a closet full of your favorite clothes that you can “raid” at any time to get more variety in your wardrobe, without having to pay for all the items. If you decide that you love something you try, you can then purchase it at a discount. Shipping is always free. It’s a great way to add some new styles & items to your wardrobe for a limited time if you have a few special events on the horizon or just want to spice things up in your wardrobe for work, date nights, etc. I am going to test this out this April so I can share with all of you, but first I wanted to share a little bit of how it works if you are interested in trying it out too. There is no styling fee at all for Gwynnie Bee so you can test it out totally for free with a 1 month trial! There is always free shipping & unlimited returns. After that, if you decide that you do not want to continue, there is no contract, no fees, etc. You just would go into your account & cancel your subscription after you returned your items. Fill out the style profile. They will ask you a few very basic questions before you sign up for your free trial & that is just to get a feel for your sizing (by asking your size in select brands). But once you submit the info for your free trial, then it will ask you more style questions – with pictures to choose between of your favorite styles so they can narrow down more of what you like. 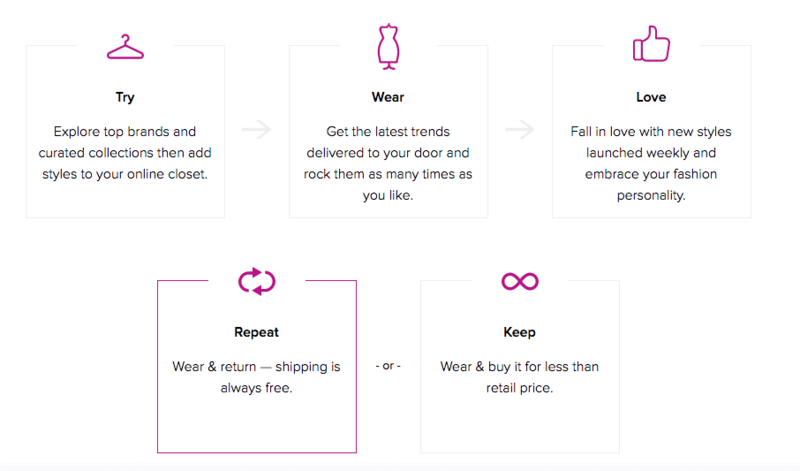 Fill your virtual closet — this is where it is different from a site like Stitch Fix in that you get to pick what items you want them to send you. They will give you selections they think you might like based on your style profile, but you have the choice to add them to your “closet”. The virtual closet is where you add at least 6 items that you would like them to send you to “rent” for a special occasion, for a holiday or just to try on to add to your collection if you decide to keep it. Receive 2 items by mail within a few days — the free 1 month trial plan is for you to receive 2 clothing items by mail. So you can try them on & see what you think! If you like them both, you can keep them as long as you like. Or wear them for a day for an event or work & then return one or both of them & they will send you new items. With the fast priority shipping, you could get 2 items every week, depending on how fast you return your new items. When you return your items, notify them online & they will send out 2 more items from your “Virtual closet”. You can add to your virtual closet at any time, so you don’t have to have the minimum 6 items, you can add as many as you’d like. If you like the idea of a personal stylist helping to choose the clothes (which is what I love about Stitch Fix), they do offer a personal styling service for free – all you have to do is email them at [email protected] to set up a time to chat with a personal stylist for clothing recommendations from the clothes on their website. Let us know if you have tried Gywnnie Bee Clothing Rental service & what you think about it! We’d love to hear your honest reviews! And check back in a few weeks to see my honest review!